Have you ever noticed that when you are looking for something that is both stylish and functional, you have to pay an arm and a leg to get it? For most affordable pieces of furniture, we have to sacrifice one or the other, and it shouldn’t be that way! 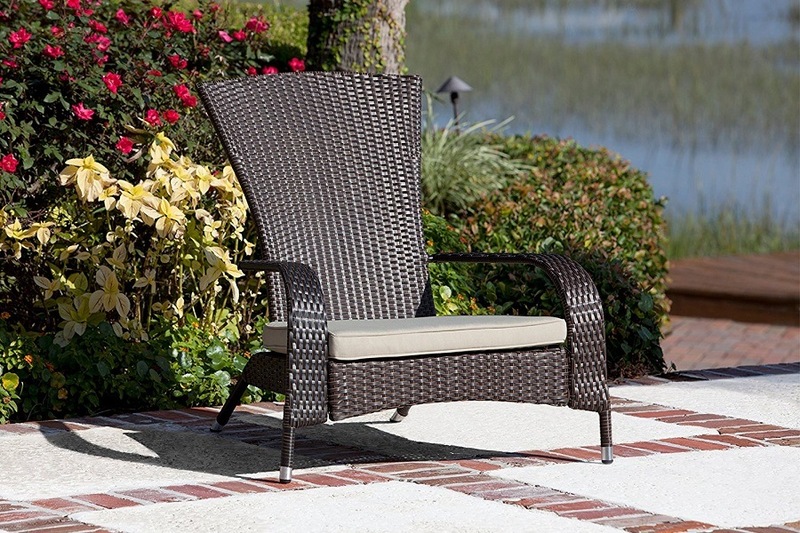 If you’re looking for a chair that is both comfortable, affordable and is going to last a long time, then that is where the Patio Sense Coconino Wicker Adirondack Chair comes in the picture. In this article, we are going to give you an in-depth look at the chair, and we’re going to examine the reviews left by people who have purchased the chair. Unlike traditional Adirondack chairs, you may find on the market, this one is made out of an all-weather wicker, so you know it is going to last anything Mother Nature throws at it. 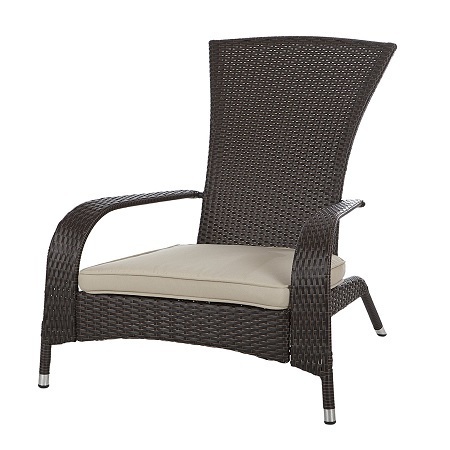 It comes with a beige cushion, making the seat a little more comfortable, but the beige also is the perfect accent to the mocha finish of the wicker. The chair itself is lightweight so you can take it from your patio to the garden with no problems. You’ll find that the there is no maintenance involved with the chair, which is a feature that many homeowners can appreciate. Who really needs just one more thing to worry about keeping clean? The assembly of the chair is detailed in a thorough instruction pamphlet. 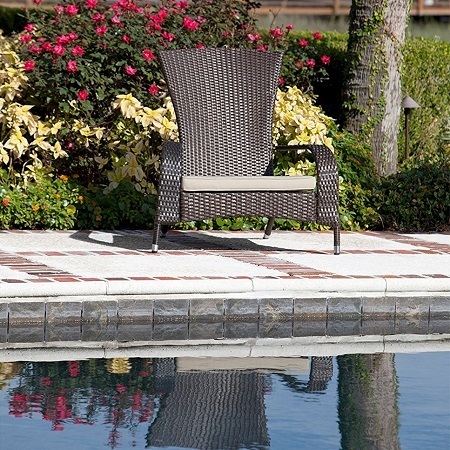 Since this set is made from an all-weather wicker, you can use the seat on your patio, but if you live near the beach, you can use it by the water without worrying if the wicker is going to decay or become ruined over time. The chairs were easy to assemble, only taking 10 minutes from start to finish. The chairs had a pleasing design that was both stylish and comfortable. The chair is at an affordable price for what you are getting. Good quality materials with a comfortable and thick cushion to boot. The screws and bolts began to rust only just a few months after purchase. The angle of the back was reclined too far, making it uncomfortable to sit upright. Some people had a problem assembling the chair. They recommend seating the screws first before tightening anything because they won’t line up otherwise. Cushion could not be cleaned and stained very easily. The wicker began cracking because of being in the sun. The weaving of the wicker goes in different directions on the seat, making the seat look odd. For a comfortable chair that is unlike traditional Adirondack chairs, but it has a similar feel, the Patio Sense Coconino Wicker Adirondack Chair is a nice and affordable option, priced at just under $95. Be warned, this is a sale price, and there’s no telling when it will end. The original price is under $160. When you purchase these chairs, you can rest assured that the wicker is going to last for a least fifteen years, which is common for this particular material. Not only will the wicker last a long time just because it is the nature of the material, but with minimal maintenance, you can help prolong it’s longevity. To clean the wicker, all you need to do is use a damp sponge and wipe away the dirt. 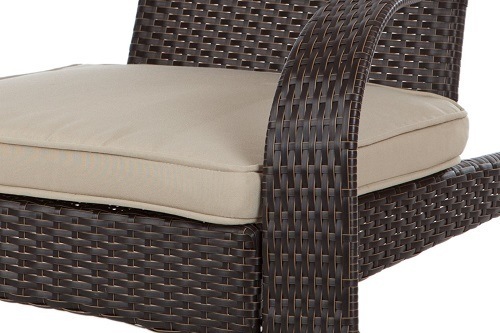 You’ll find that the deep mocha color of the wicker and the creamy beige cushion will accent any home beautifully. Not only will it look great on your patio, but it is lightweight enough to move it to other spots in your hard without any hassle. When we were trying to decide if this chair is worth your hard earned money, we looked at the reviews from other customers on Amazon to see what they had to say. 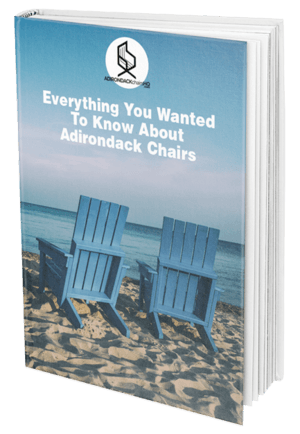 Since the chair had 79% positive reviews, we feel that yes, perhaps this chair is a good purchase, especially if you enjoy the look of Adirondack but you don’t want a heavy wooden piece of furniture. We do recommend that if you purchase this chair, you do not use the hardware that is included with the chair, simply because there has been numerous complaints about how quickly the screws and other hardware rusted. We do recommend that you spend an additional $15 on stainless steel hardware. Or, better yet, if you have stainless steel screws in your garage, use them. 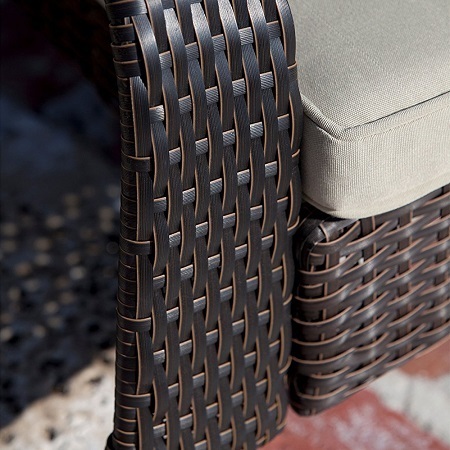 While it is a slight inconvenience to use different hardware than what is provided, you will have a beautiful and comfortable wicker seat that is not going to rust within two months of purchase! While the chair does come with a seat cushion, if you are concerned about the support with this chair, you can use a lumbar pillow to give you that extra bit of comfort that you may be looking for while you watch the sunset or just enjoying a cup of tea with your loved one. Either way, we feel this chair is worth the purchase!